I love soup. Warm. Easy. Comforting. 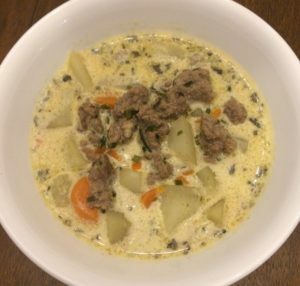 Watch the video to see how easy it is to make cheeseburger soup. The recipe, as well as Tip and Tricks, are included. Brown ground beef. Add potatoes, broth and spices and bring to boil. Then let it simmer for 10 to 12 minutes or until potatoes are cooked. Finally, mix in the carrots, cream and cheese and cook until cheese is melted and carrots are hot. Place diced potatoes in a plastic container and cover them in water to prevent discoloring. They will stay good several days. Fiskars Easy-Action Scissors are my go-to for opening packages. I have enough of a grip due to my tendon transfers to close these spring-loaded scissors.